Using tough benchmarks, Collins and his research team identified a set of elite companies that made the leap to great results and sustained those results for at least fifteen years. How great? After the leap, the good-to-great companies generated cumulative stock returns that beat the general stock market by an average of seven times in fifteen years, better than twice the results delivered by a composite index of the worldÕs greatest companies, including Coca-Cola, Intel, General Electric, and Merck. * Level 5 Leaders: The research team was shocked to discover the type of leadership required to achieve greatness. * The Hedgehog Concept (Simplicity within the Three Circles): To go from good to great requires transcending the curse of competence. * A Culture of Discipline: When you combine a culture of discipline with an ethic of entrepreneurship, you get the magical alchemy of great results. * Technology Accelerators: Good-to-great companies think differently about the role of technology. * The Flywheel and the Doom Loop: Those who launch radical change programs and wrenching restructurings will almost certainly fail to make the leap. Some of the key concepts discerned in the study, comments Jim Collins, "fly in the face of our modern business culture and will, quite frankly, upset some people. Perhaps, but who can afford to ignore these findings? Jim Collins is a student and teacher of enduring great companies -- how they grow, how they attain superior performance, and how good companies can become great companies. Having invested over a decade of research into the topic, Jim has authored or co-authored four books, including the classic BUILT TO LAST, a fixture on the Business Week best seller list for more than six years, and has been translated into 25 languages. His work has been featured in Fortune, The Wall Street Journal, Business Week, Harvard Business Review, and Fast Company. 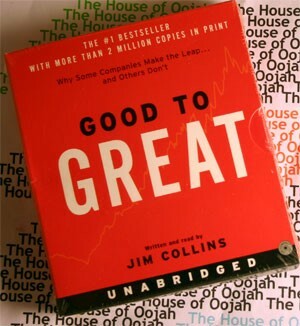 Jim’s most recent book, GOOD TO GREAT: Why Some Companies Make the Leap … And Others Don’t attained long-running positions on the New York Times, Wall Street Journal and Business Week best seller lists, has sold 2.5 million hardcover copies since publication and has been translated into 32 languages.